I’m a transplant from The West—the Great Plains to be more specific: A vast under-watered area covering parts of 10 states. Picture a lonely landscape of farms, ranches, and open skies dotted with small towns populated with stubbornly independent people shaped by a climate prone to extremes. Surprisingly, though, when I first visited Philadelphia what I felt was far from culture shock. Rather, I was struck with and fascinated by the density, infectious vibrancy, and intimacy of the city. I’d venture to say there’re few other places where, during the summer, its residents gather on their front stoops rather than backyard enclaves, and where block parties flourish. This is the Philadelphia QUEST depicts brilliantly—a place of close-knit communities, openness, creativity, and diversity. But far from naïve, the film is simultaneously unflinching in its portrayal of the problems of economic and racial inequity, and the tragedy of gun violence plaguing the city. Since first watching QUEST a few weeks ago, there’s scarcely been a day when I haven’t thought about scenes from the film and its characters. Just as it shows some of the best of Philadelphia as a city, QUEST also puts into sharp focus the best of what human nature can be, too. The power of empathy, hope, generosity of spirit, and community are ever-present. 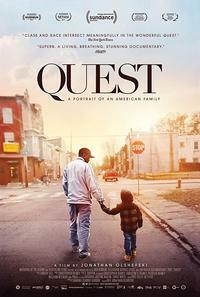 And, because of the intimate way QUEST is filmed and how, as a viewer, it draws one into the Rainey family home, it feels heartbreakingly tender in ways words can’t adequately express. Love and human connection are the overarching themes throughout. It’s notable, and ironic in some ways, that QUEST was released in this period in our national history when so many hard-edged social and economic issues have become front and center—economic inequity, social injustice, and bald-faced racism and xenophobia. More than ever, the Free Library strives to be an integral part of the community, and to serve as a welcoming and safe gathering place for all to learn and explore, and to provide a forum for discussion and to even foment constructive action around these issues. It would be an opportunity missed to do anything less. Free Library programming that supports individuals and families is abundant and includes afterschool enrichment programs for children and teens, partnership in the citywide Read by 4th initiative, and prison services for incarcerated individuals, including parents and their children and families. Another resources gateway is through our vast Databases page, where you will find Opposing Viewpoints in Context, another portal of sorts to a variety of media. 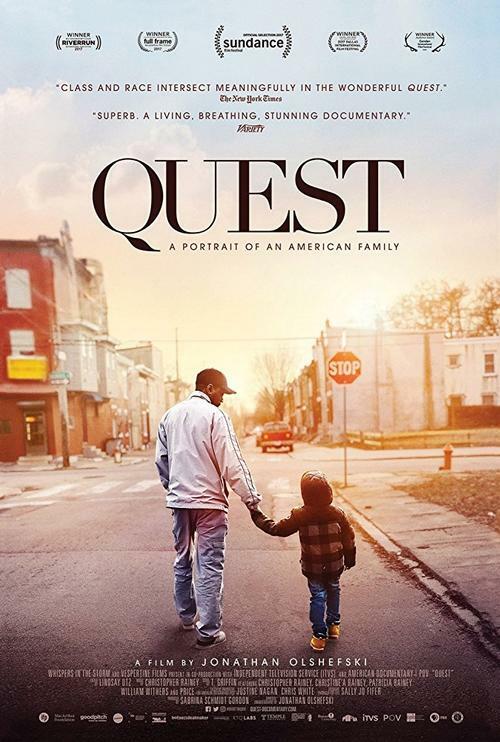 A free screening of QUEST will take place in the Montgomery Auditorium of Parkway Cenral Library on Wednesday, July 11 at 7:00 p.m. The screening will be followed by a Q&A and a chance to meet principals of the film including members of the Rainey family and the filmmakers, Sabrina S. Gordon & Jonathan Olshefski . Seating is first come, first served. Overflow seating will be available in the Skyline Room where event will be simulcast. This intimate, critically acclaimed documentary captures eight years in the life of an African-American family living in North Philadelphia.